Six separate investigations have led to the arrests of medical professionals, including New York doctors, who are accused of giving out millions of Oxycodone pills in exchange for cash. Andrew Siff reports. Six separate investigations have resulted in the arrest of five doctors, a pharmacist, a nurse practitioner, and two others all of whom face decades in prison if convicted of illegally prescribing and distributing millions of oxycodone pills, prosecutors say. Dante A. Cubangbang, 50, a physician, and John F. Gargan, 62, a nurse practitioner, together with two other defendants, operated a medical clinic in Queens. Cubangbang and Gargan allegedly prescribed over 6 million oxycodone pills to individuals who had no medical need and collected over $5 million in cash fees. Cubangbang allegedly prescribed 12,000 opioid pills to just one patient, according to the criminal complaint. Together, Cubangbang and Gargan prescribed more than twice as many oxycodone pills paid for by Medicare and Medicaid than the next highest prescriber in New York, court papers say. "They are the highest prescribers of oxycodone in the entire state," U.S. Attorney Geoffrey S. Berman said. In 2012, the I-Team obtained a list by the New York State Department of Health that outlined prescriptions that were covered by Medicaid in 2011 and shows exactly how much taxpayers shelled out based on each doctor’s recommendations and the specific number of prescriptions each doctor approved. Cubangbang was among the top 10 prescribers for the opioids of Opana and Oxycontin on that list. Another doctor facing charges following the investigations is Carl Anderson, 57, a Staten Island physician, who allegedly prescribed over one million oxycodone pills to individuals with no medical need and who, in many cases, displayed visible signs of drug addiction and met them without appointments and sometimes in the middle of the night. Anderson also prescribed pills to another defendant, Arthur Grand, who sold them on the street, court papers say. Anthony Pietropinto, 80, a psychiatrist, allegedly wrote thousands of oxycodone prescriptions in exchange for $50 to $100 in cash fees paid for after-hours visits to office space he rented, prosecutors say. 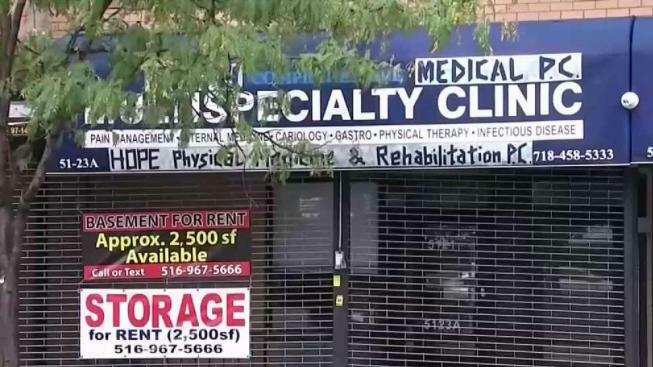 NKanga Nkanga, 65, a Staten Island physician, allegedly prescribed thousands of oxycodone pills to patients including to some who showed signs of drug addiction and to others whom he never examined, prosecutors say. Nadem J. Sayegh, 64, a physician with offices in the Bronx and Westchester who is from Yonkers, Queens, is charged with writing oxycodone prescriptions to an individual and to that person’s family members’ names, and variations of those names, in return for thousands of dollars in cash, expensive dinners, cruises and all-expense paid trips, court papers say. Marc Klein, 47, a White Plains pharmacist, filled oxycodone prescriptions he knew were illegitimate and made false reports to New York State authorities in return for cash and a vacation, court papers say. In the Thursday press conference announcing the opioid drug bust, Berman pointed to a chart showing the skyrocketing scourge of opioid drugs. "We are in the middle of an opioid epidemic of grave proportions," he said, adding that one reason was alleged shady doctors. Parts of the cases were investigated by the DEA’s Organized Crime Drug Enforcement Task Force comprised of federal, state and local law enforcement agencies. The defendants are expected to appear in federal court in Manhattan Thursday afternoon. Attorney information for the defendants was not immediately available.